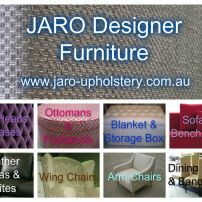 commented on "JARO Designer Furniture - Bed Heads, Sofas, Ottomans, Lounge Suites, Wing & Arm Chairs in Pakenham"
Custom Made Australian Designer Furniture manufactured in Pakenham, Victoria. The team at JARO Upholstery can help you design and manufacture the perfect piece for your home, workplace, holiday house, office, foyer etc. 100s of designs and colours!